TAIPEI, Taiwan, February 11, 2016 (ENS) – The death toll from Saturday’s earthquake in Taiwan stands at 67 people, with 57 others still missing and presumed trapped under the rubble of a collapsed residential building, Taiwan’s Ministry of Interior said today. Rescue teams worked around the clock to find survivors, but rescuers now say the chances of finding anyone else alive are small. The 6.4 magnitude earthquake struck Kaohsiung province in the south of Taiwan before dawn local time on Saturday, when most people were sleeping. The 16-story Wei Guan Golden Dragon apartment building collapsed seconds after the quake, according to an official update on the casualties. A total of 238 people were rescued from the building, but 57 are still missing nearly six days after the quake. Amid accusations that the 1989 structure was not properly reinforced, government prosecutors have detained three construction company executives on suspicion of professional negligence resulting in death. Red Cross emergency activities in Tainan City were part of extensive rescue and relief operations that involved around 5,000 government workers, 24 rescue dogs and five helicopters closely coordinated through a designated command center. Five rescue teams from Taiwan Red Cross Organization have been supporting government and military emergency services in searching the ruins of damaged buildings in Yong Kang district of Tainan City. In the most difficult cases, the teams have spent hours digging through a maze of broken concrete walls and rubble. “Our priority is to search for people who might still be alive,” says Taiwan Red Cross Organization officer Lisa Hsu who has been supporting the Red Cross operation since the disaster struck. 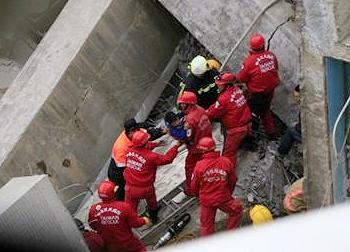 In one case, Red Cross workers discovered a little boy who was trapped deep inside one of the buildings. The boy, of kindergarten age, was still conscious but a cement wall had fallen on his hand and the task of getting him out turned out to be complicated.